Cisco related posts. Routing, switching, unified communications, etc. A lot of people run into me in the Cisco Support Forums as I try to keep pretty active not only to keep my memory fresh on some stuff I don’t touch much but to also keep a pulse on what the world is working on. The forum allows other users to provide you with points based on how they find your answers useful. Just got to the next level based on points awarded, a lovely shade of blue. Recently had a hard time figuring out how to get to the RAID confirugation tool in a C240 M3. No matter how much I put in Control-R or Control-V or any other convination I always ended up in EFI Shell. 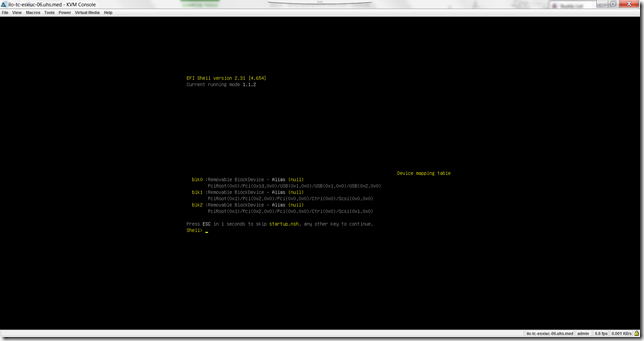 Well, the WebBIOS is actually right behind the EFI Shell. Just type “exit” and enjoy. Killed me. Maybe I should have checked CUIC to see if there was something, but I don’t remember something like this available. All I wanted was to see all my agents their attributes and levels. Finesse Error: The device associated with that extension or dial number is invalid. 16:48:24:420 PG1A-jgw1 Trace: MsgAddCallObserver: Addr: 7778 Remote Addr: 0 InvID: 8380 CallDeliveryMode ID: 0. 16:48:24:420 PG1A-jgw1 Trace: Adding Call Observer to: 7778. 16:48:24:420 PG1A-jgw1 Trace: Address Name: 7778IP Addressing Mode:IP_ADDRESSING_MODE_IPV4. 16:48:24:420 PG1A-jgw1 Trace: AddCallObserver address validation failed – Address Name: 7778, error code: 154. 16:48:24:420 PG1A-jgw1 Trace: MsgAddCallObserverResponse: Addr: 7778 Succeeded: 0 InvID: 8380 Cause: 154. Which then let me to this link. The problem was something I’ve never had to set in the UCM before. Join And Direct Transfer Policy. Once that was changed the the phone recycled, everything worked. Go figure.